A missed luncheon and a close call in the North Channel. 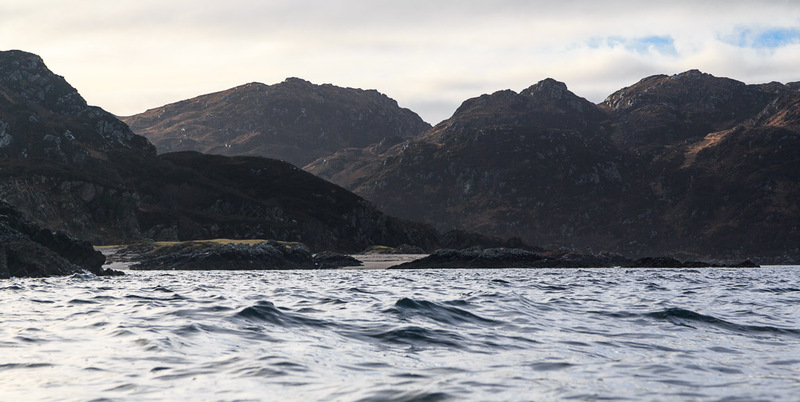 From the Sound of Arisaig we turned south past the abandoned village of Smirisary and along the wild Moidart coast. We were thoroughly enjoying the more lively waters which we found out with the shelter of the Sound. ...white shell sand tombola beach, backed by machair, at Port Achadh an Aonaich. The Gaelic means "port of the field of the steep place". It would have been a magnificent place to stop for first luncheon, whatever were we playing at? 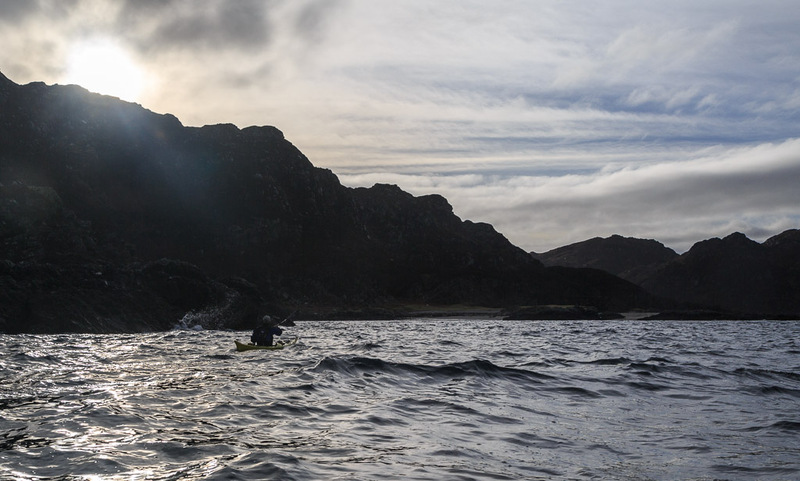 Well the steep profile of Eilean Shona should give a clue. 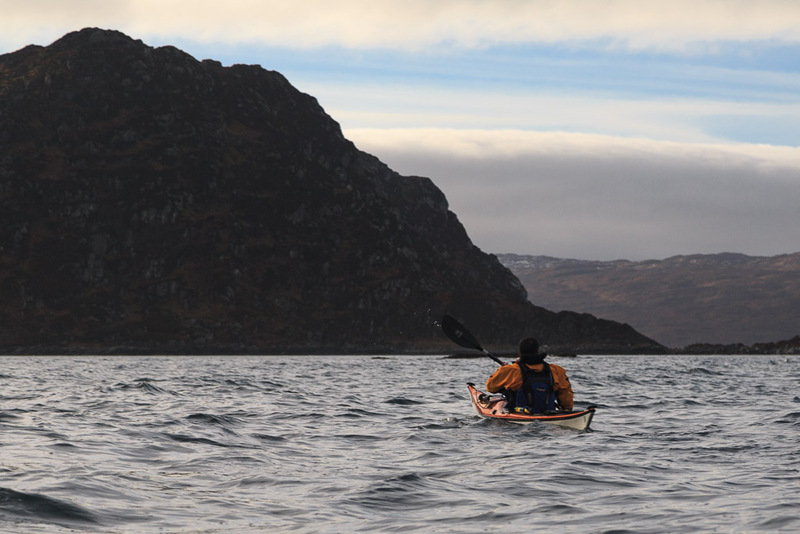 We hoped to circumnavigate this bold and rocky island, which sits in the mouth of Loch Moidart. However, we faced a slight impediment. 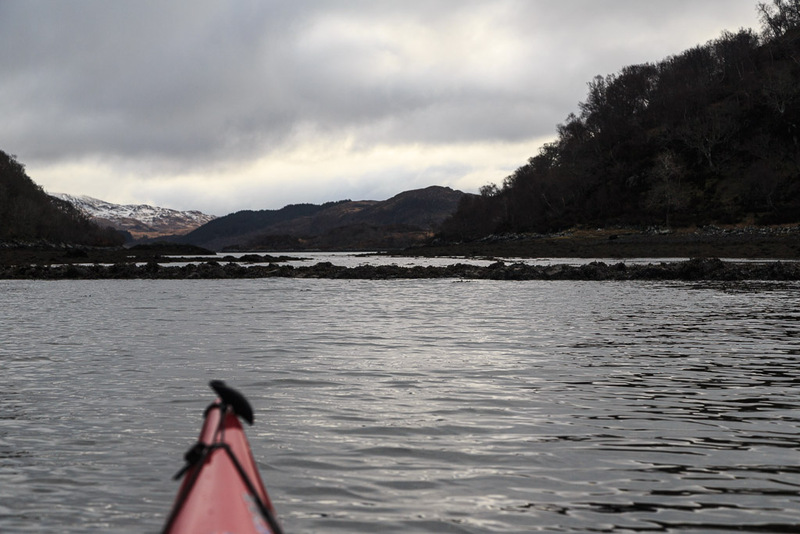 It is a tidal island and the narrow north channel of Loch Moidart dries to reveal 1.7km of soft, glutinous, stinking mud. HW had been at 07:45 and it was already 10:45, three hours after HW! 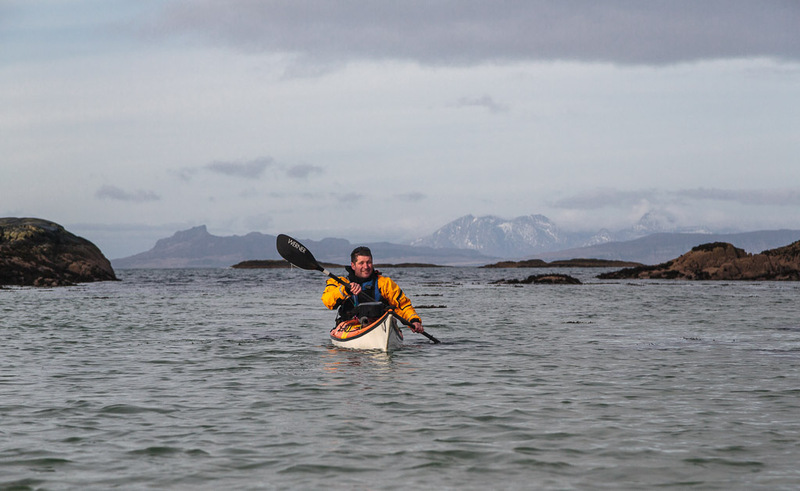 Not only that it would take nearly another hour to paddle the North Channel up to the causeway at its shallowest part! 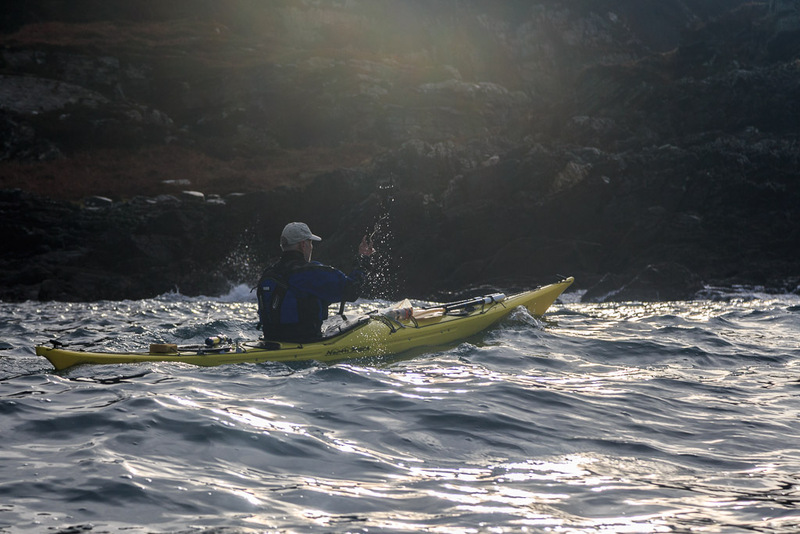 So we passed by the delightful sands and machair and set off on a stiff paddle, trying to beat a falling tide in an emptying channel! 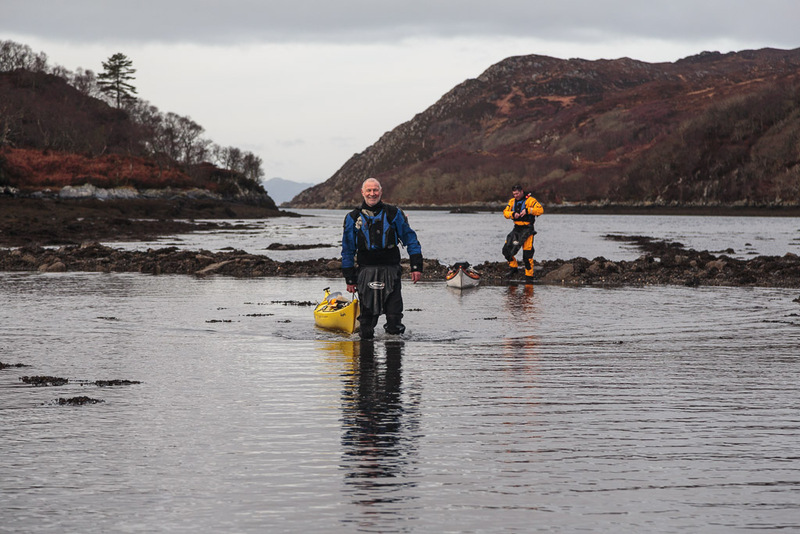 You will note that Ian is looking resplendent in mango in his new Kokatat Expedition drysuit. There was not a hint of perspiration on his brow. Despite our exertions, his suit was so breathable he hardly noticed he was wearing it. This brings me to a sad story about my own Kokatat dry suit. It was lying on my couch at home, some 150 miles away. I had not being feeling very well when I packed and I had clean forgot it. Fortunately Ian still had his old dry suit in his car and he kindly lent me it. What a difference though, it was a true boil in the bag experience! At least there was still water as far as we could see. 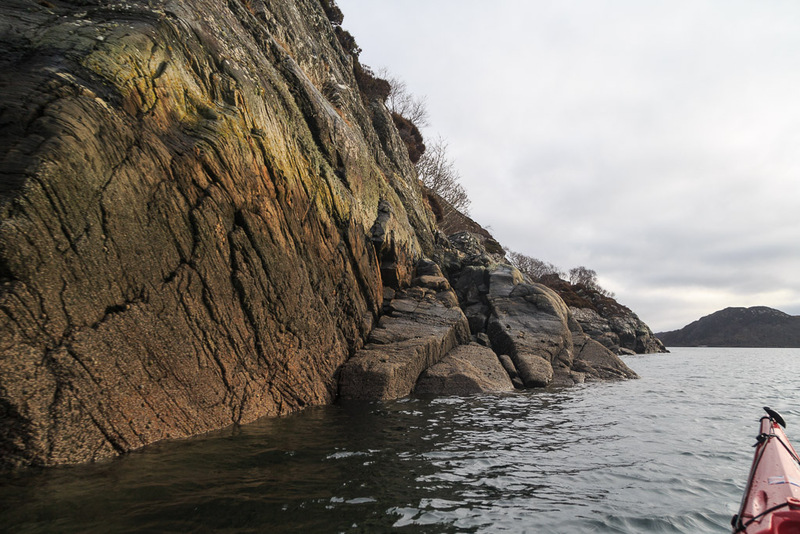 We kept out of the main ebb by sticking close to the rocky walls of the channel, almost as close as the limpets and barnacles! 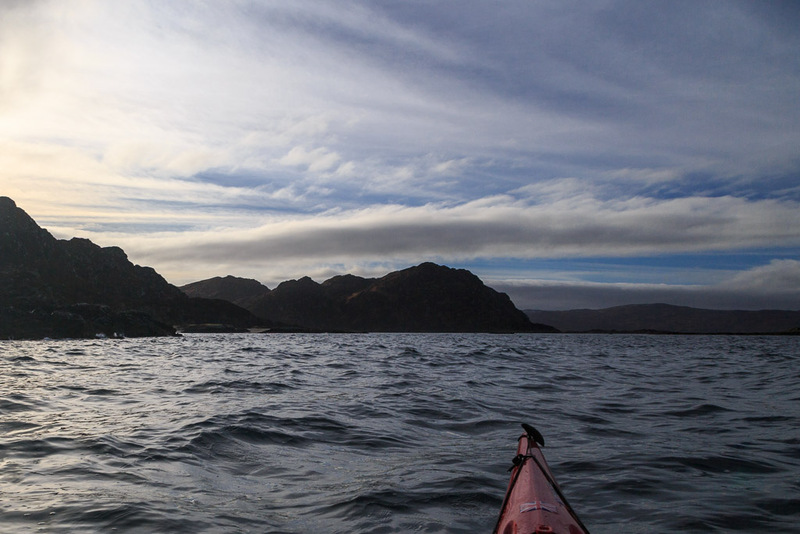 Amazingly we were able to paddle right up to the causeway. where we arrived at 11:25. Water was pouring through the rocks of the causeway towards us but we were not out of the woods yet. The water east of the causeway disappears faster than snaw aff a dyke especially at springs (which it was). 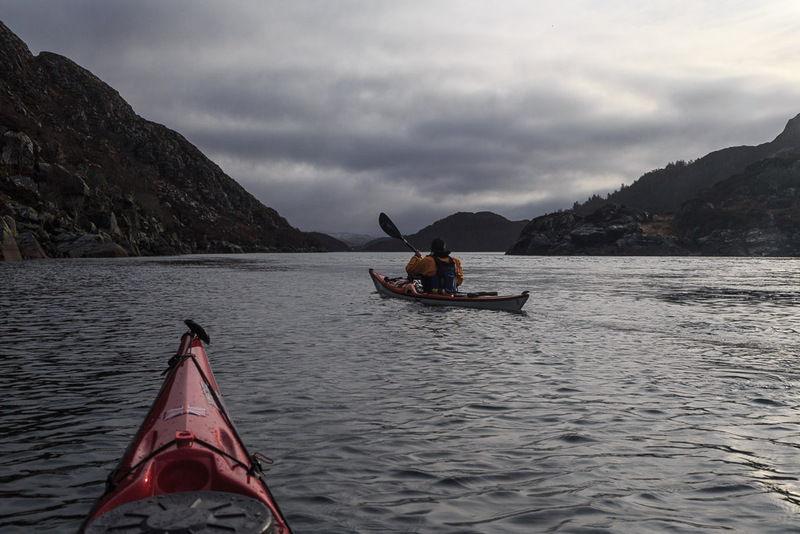 After a short portage over the causeway, we had to walk the kayaks through the shallows for 120 metres on the far side. Fortunately,the ebb tide was with us and we escaped the clutches of the evil mud with minutes to spare.